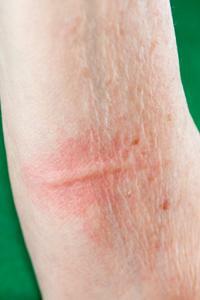 Unsightly rashes can strike anywhere. It may be a normal occurrence, but that doesn't make suffering a sweat rash any more bearable. In fact, this uncomfortable skin condition can really wreak its own special brand of havoc - not only does it feel terrible, it also looks unsightly, too. The combination is enough to drive some people crazy, but fortunately there are ways to combat and even prevent it from happening. These are the symptoms at their most general, but miliaria presents itself in a number of different ways because it is classified into several categories. Different variations of miliaria may appear slightly different from one another. Miliaria crystallina occurs when the sweat ducts nearest the skin's surface are obstructed. The result is small, superficial blisters that are easy to break. This is the mildest form of the condition. Miliaria rubra, more commonly known as prickly heat, occurs when the obstruction causes the blocked sweat to leak deep into the epidermis, or the skin's outside layer. This results in raised, red bumps that are extremely itchy. Miliaria profunda is easily the most uncomfortable manifestation of the condition. When it occurs, the sweat leaks into the skin's middle layer, or the dermis, resulting in an intense, prickly sensation and visible red lumps. Miliaria pustulosa refers to the pustules that occur when the skin is inflamed and infected with bacteria. As mentioned, a sweat rash can occur for any number of reasons. It's common among individuals who are exposed to humid, hot conditions, as in desert areas or tropical climates. Athletes are also susceptible to it, because they may experience chafing when sweat is trapped between layers of touching skin (as between the thighs, for example). Sweat rash occurs most commonly during the summer, but it's not entirely dictated by the warmest season of the year. In fact, it can even happen during the winter, when wearing layer upon layer of clothing can cause sweat to get trapped. It can also result from sitting too close to a fireplace, heater or even using a heating pad or electric blanket for prolonged periods. The condition might also be seen in patients who are suffering from various diseases. In hospitals, it's not uncommon for patients to suffer from sweat rash because they have been on their backs for so long. Sweating due to infections, chemotherapy treatments or heart attacks might also cause the discomfort of a heat rash. You're tempted to scratch up a storm and can't bare the thought of wearing anything that will expose that unsightly skin to the world. The solution is to form a plan of attack that really nips the problem in the bud. The main key is to avoid sweating any more if at all possible. Whether this is achieved by sitting in front of an air conditioner or spending time in a very cool room, it can provide instantaneous relief when done for prolonged periods of time. If your rash is accompanied pus or any type of open blister, seek a doctor's opinion immediately. You may require more aggressive therapy.